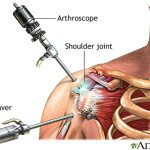 Arthroscopy is a minimally invasive surgical technique utilized to treat various conditions of joints. The most common joints treated are the shoulder, hip, knee, elbow and ankle. 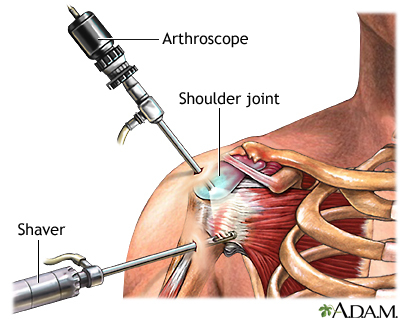 Arthroscopy is performed through a few small incisions usually 5-10 mm in length. These incisions are known as portals. One portal is used for the camera and the others are for tools and instruments specially designed for work inside the joint. Many different conditions can be treated successfully with arthroscopy. However, not all conditions are treated appropriately with arthroscopy and may warrant an open procedure to best treat the patient. The surgeon will determine this based on the type of condition one has. Synovitis, inflammation of the lining of the joints. During arthroscopic surgery, either general, spinal, or local anesthesia will be given, depending on the condition. You will be instructed about wound care, activities to be avoided, and exercises to be performed for a fast recovery. You will follow up with your surgeon approximately one week after surgery. A rehabilitation program may be prescribed for a quick recovery. You can usually resume normal activities within a few days, according to your doctor’s recommendation. Sports injuries can occur during sports or exercise activities. Sports injuries may result from accidents, inadequate training, improper use of protective devices, or insufficient stretching or warm-up exercises. The most common sports injuries are sprains, strains, fractures, dislocations and ligament injuries. The usual treatments recommended for these injuries are rest, ice, compression, and elevation (RICE). Rest: Avoid activities that may exacerbate the pain and current injury. Ice: Ice packs can be applied to the injured areas. These will help to diminish swelling and pain. Ice should be applied over a towel to the affected area for 15-20 minutes, four times a day for several days. Never place ice directly on the skin. Compression: Compression of the injured area helps to reduce swelling. Elastic wraps, air casts, and splints can accomplish this. Following an exercise program to strengthen your muscles. Gradually increasing your exercise level and avoiding overdoing exercises. Ensuring that you wear properly fitting protective gear such as wrist guards, eye gear, facemasks, mouth guards, pads, comfortable clothes, and athletic shoes for playing any sports activity. Making sure that you do warm-up and cool-down exercises before and after sports activities. These exercises will help to stretch muscles, increase flexibility, and reduce soft-tissue injuries. Avoiding exercise immediately after eating a large meal. Avoiding play when you are injured or tired. Learning all the rules of the sports you play. Ensuring that you are physically able to play the sport. Click on the topics below to read more about them on the American Academy of Orthopaedic Surgeons website. Shoulder injuries are common in sports such as tennis, basketball, or gymnastics. Shoulder injuries include torn tendons or ligaments. These injuries may be caused by overuse or trauma while playing sports. Shoulder injuries may be treated in a conservative manner, or may require surgery. Fractures of the femur bone, labral tears, and hip strains are some of the common sports injuries affecting the hip. The hip joint bears significant weight and is very susceptible to sports injuries. Hip injuries require immediate medical attention to avoid further complications. Rehabilitation programs and physical therapy are often recommended following treatment. The anterior cruciate ligament (ACL) is a major stabilizing ligament in the knee, which may tear during sports activities. Other common sports injuries to the knee include meniscal tears and other types of cartilage damage. Sports injuries of the knee frequently require surgical treatment that can usually be performed using minimally invasive arthroscopic techniques. After surgery, your surgeon will generally recommend physical therapy to strengthen your muscles and to increase range of motion of your joints. For more information or to schedule an appointment with Dr. Abdulian, please visit our contact page for telephone numbers, addresses, and directions.